50 years ago, virtually all carpets were made to last a lifetime if cared for properly. Not anymore! Today you must choose a carpet that is designed to meet or exceed your needs, goals and lifestyle, or else you will end up with a carpet that wears out way faster than you might expect! During the 1950's and 60's, Most residential carpets were made of 100% NYLON. There were basically three grades of carpet to choose from, good, better and best. The lowest grade carpet was designed to last 10-20 years or more before it would show any signs of wearing out. Medium and higher grades could easily last 30 years or more, even in heavy traffic applications! Many of these vintage carpets are still in use today in homes all across America, and many still look pretty darn good! We still see nylon carpets in homes that were originally installed in the 1950's and 1960's. They were made of a heavy gauge NYLON. All homeowners had to do was give them a good cleaning every few years and their carpet would look almost like new again, decade after decade. What is Carpet Denier? Today, like everything else we buy, carpets are not made nearly as durable as they once were. Today carpet manufacturers cut corners wherever they can to save money and offer a different grade of carpet for virtually every homeowners application. Carpet manufacturers today make at least 12 basic grades of carpet to choose from. The trick for homeowners is knowing which grade of carpet to buy that is designed to meet or exceed their expectations and still be affordable. There are at least 3 grades of low-end carpets designed for apartments and rental property and is typically called "builder-grade" or "apartment-grade" carpet. These low-cost carpets are only designed to last 3 to 5 years at best. The face weights are generally 22 ounces to 30 ounces. Prices range from $8 per square yard to $15 per square yard for the carpet only. There are at least 6 medium-grade carpets for those who want a carpet to last for 6 to 12 years. Face-weights range from 30 ounces to 40 ounces. Prices range $18 to $30 per yard for the carpet only. The fiber, pile height, tuft twist and pile density are the main four factors that determine how long the carpet will last and prices increase accordingly. What makes one carpet better than another? There are at least 3 high-end grades of carpet for those who want their carpet to last 12-20 years or more and are willing to pay dearly for it. The best quality fiber, usually Stainmaster nylon 6.6 or wool. These are made very well, easier to clean, more resilient, resist fading, better color choices, more durable, more styles to choose from, etc. You always get a much better backing system. The backing will have a much tighter weave, is much heavier construction, better materials and is much more durable. This also helps prevent wrinkling and delaminating. The pile density will be higher, often more than 3000. Higher density carpets can tolerate higher traffic applications and and increased ease of cleaning. The tuft-twist rating will be higher (in the 6 to 9 range). Higher tuft-twists make carpets retain their like-new appearance longer. Costs will be $45 to $85 per square yard for carpet only. Pad and install is extra. Expect to pay more for installation as these high quality carpets are usually heavier and more difficult to install. I've just mentioned 12 different grades of carpet to make it easy to understand. But in reality, there are dozens of varying grades of carpet to choose from, all at varying prices and warranty levels. A higher price does not always mean it is a better or longer lasting carpet. A thicker pile height or higher face-weight carpets are not always worth more or are more durable. The key is to choose the right fiber for your needs and goals. The type of fiber you choose is very critical. Nylon is always a better choice than Polyester if you want your carpet to last a long time and not mat down quickly. Choosing the wrong grade of carpet is the biggest mistake homeowners make. Why? Because the carpet you buy MUST meet or exceed your needs and goals or you will not get the results that you desire. Why spend thousands on a carpet that won't last as long as you hope? 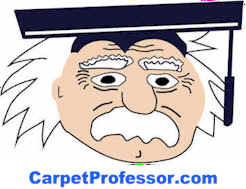 Check out my Carpet Durability Guide to get a better idea about how to compare carpet specifications and understand what makes one carpet more durable than another. It's getting harder everyday to find an honest and reputable carpet dealer! That's why I have my own special hand-picked list of Carpet Dealers who are locally owned, give free estimates, offer fair prices, have knowledgeable staff, provide honest measuring and hire qualified installers. 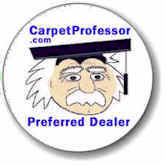 How to select carpet and pad, get qualified installation, avoid carpet scams and get a fair deal!